I was walking along the Chuckwagon Trail with the sun about to crest the horizon when the pattern recognition part of my brain thought it saw a distant deer hidden behind some plants. On second glance I was less sure and thought “There you go again, turning trees into deer.” I lifted the telephoto lens to my eye anyway and the tree was a deer, it walked out into the open as it ate soft plants as it strolled along its path, then did the little mule deer hop to move down the hillside. My pattern recognition self was feeling pretty smug the rest of the hike, even when he was spotting marmots in the rocks though there are no marmots in Arizona. That will take a while to go away, after spending a summer in Florida it took years for me to stop thinking I saw alligators in the marshes of Oregon and Washington. I don’t mind, the successes are worth the failures, and if you don’t look you can’t see. 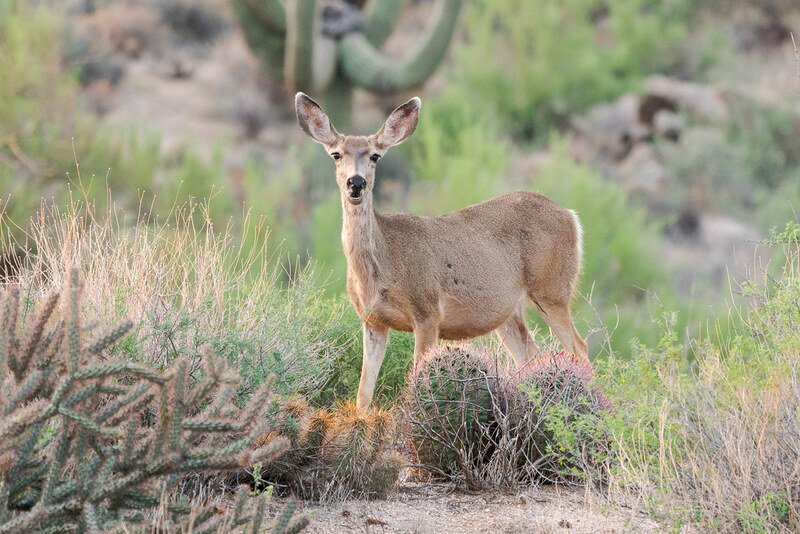 This entry was posted in Mammals and tagged Arizona, Brown's Ranch, Chuckwagon Trail, desert, eating, McDowell Sonoran Preserve, mule deer, Scottsdale, Sonoran Desert. Bookmark the permalink.